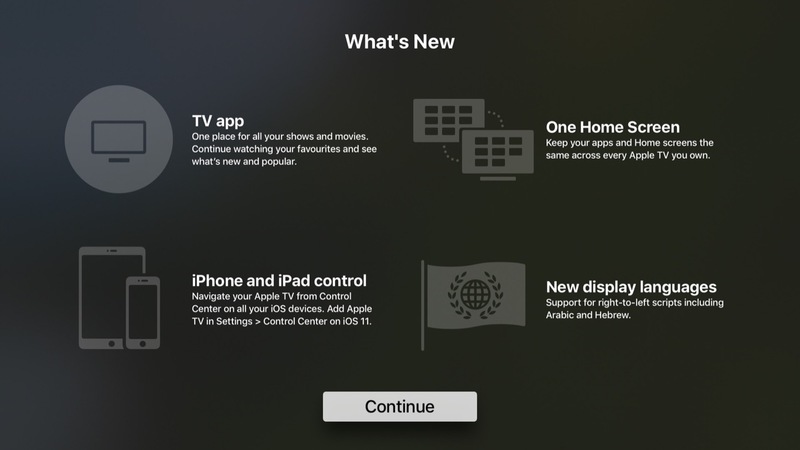 Although it received no special mention at last week’s event, Apple quietly released tvOS 11 yesterday alongside its considerably larger updates to iOS 11 and watchOS 4. While it’s a surprisingly minor update considering the new version number, tvOS 11 does add a few small and interesting improvements that help enhance the Apple TV experience. tvOS 10 introduced a new Dark Mode to the Apple TV — a welcome change in our opinion from the garishly bright white background that heralded the fourth-generation Apple TV UI. 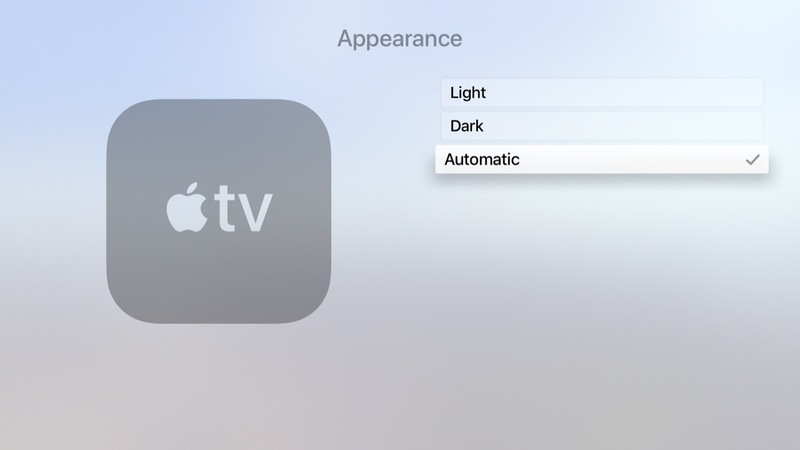 We’ve generally been pretty content to use Dark Mode on our Apple TVs all the time, but we can understand some users may want to switch back and forth, using the original Light Mode during the daytime, but switching the more subdued Dark Mode at night, so tvOS 11 now allows for this with a new “Automatic” option. You’ll be prompted to enable Location Services the first time you switch this on, as tvOS will use your current location to figure out sunrise and sunset times. Once enabled, the Apple TV will switch into Dark Mode at sunset, and back into Light Mode at sunrise. It seems that one of Apple’s goals with its new releases this year is to sync even more information via iCloud; iOS 11 users will gain the ability to sync Messages and Siri information between devices using iCloud, and tvOS 11 isn’t left out of the iCloud game either — you’ll be able to store your Home screen layout in iCloud, along with your installed apps, so that this information can be synced across multiple Apple TVs, and restored should you ever have to reset or replace your Apple TV. 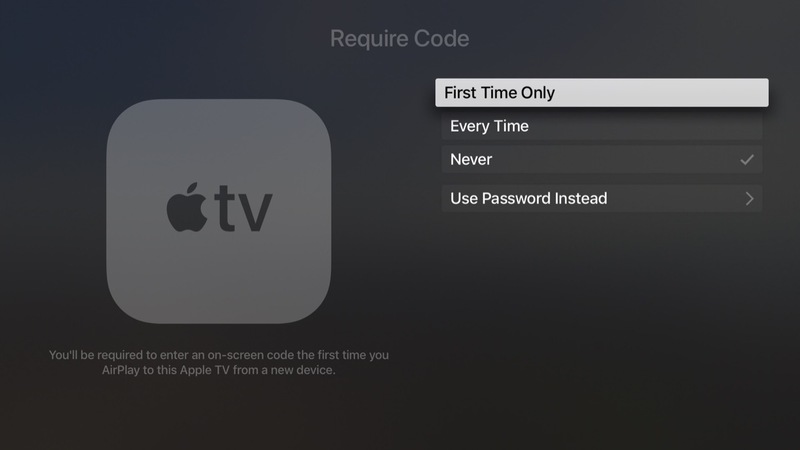 It was a feature that was kind of conspicuously missing in tvOS 10, so it’s good to see Apple finally addressing it. 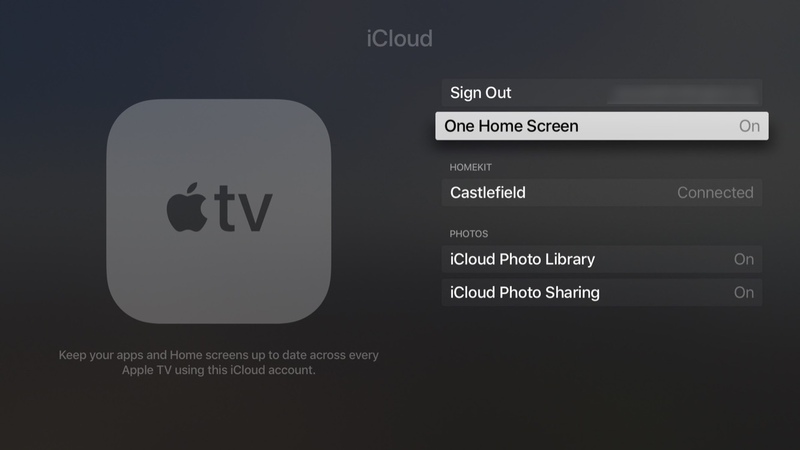 The option to enable this can be found in the your iCloud account settings (Settings, Accounts, iCloud) as “One Home Screen,” and is simply an on/off toggle. The AirPlay Settings now include an additional setting that allows you to decide whether users can stream to your Apple TV via AirPlay from any device within Wi-Fi range, or whether AirPlay devices have to already be joined to the same Wi-Fi network as your Apple TV. The Security options available will also depend on which Access option you choose: “Same Network” allows you to select “None” as an option, relying simply on your normal Wi-Fi access controls; however if you choose to grant access to “Everyone” then you’ll need to at least require a first-time passcode as the minimum security, to prevent just anybody in the neighbourhood from randomly broadcasting to your Apple TV. This will make it easier to allow guests and visitors to stream to your Apple TV without having to first join your Wi-Fi network, and we can see this being especially useful in conference room or classroom environments. The standard video player has received a couple of interesting tweaks. While a single tap on the Siri Remote touchpad brings up the scrubber timeline as before, tapping a second time will now switch to a time-of-day display, showing the current time by the playback position and an estimate of what time the video will finish at the end of the timeline. You can also now double-tap on the Siri Remote touchpad to zoom in and out when viewing 4:3 or 2.35:1 content, and a triple-tap will toggle subtitles on and off, if available; this could previously be accomplished with an accessibility shortcut, however now it’s built-in and works independently of the accessibility shortcut option, which remains assigned to a triple-click of the Menu button, as before. 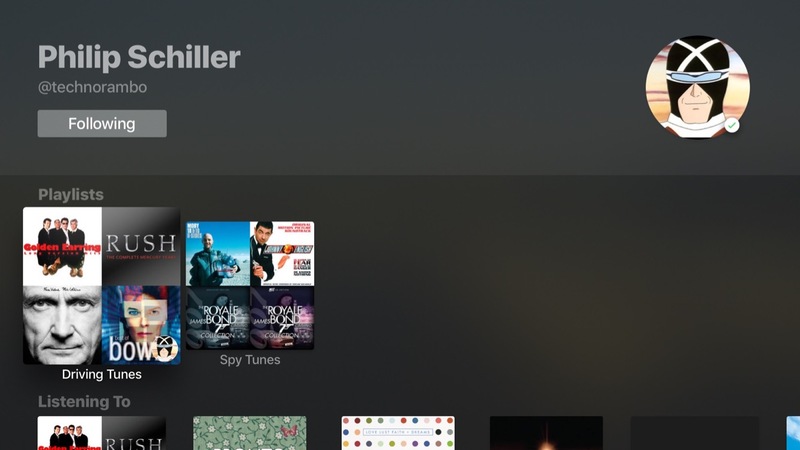 The Computers tvOS app — used for accessing content stored in your local iTunes library — has been something of an anachronism in the Apple TV environment, maintaining a UI that was far more reminiscent of the third-generation Apple TV, with vertical hierarchical menus for navigating content. 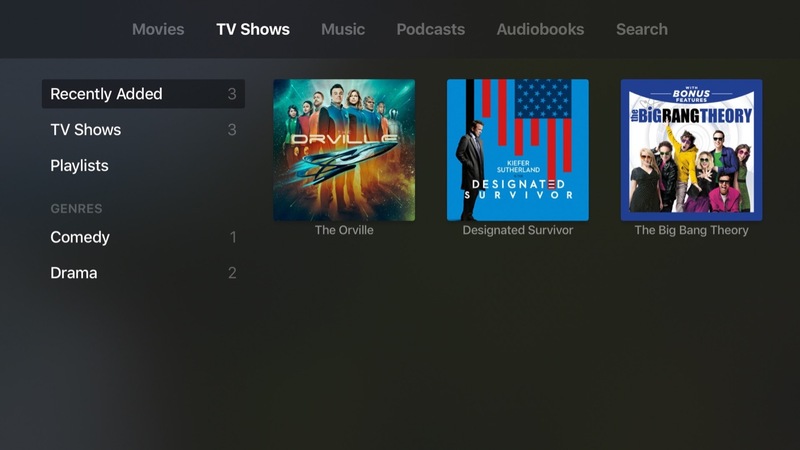 tvOS 11 finally brings the Computers app into line with the rest of the tvOS experience, adding a top navigation bar for content types such as Music, Movies, TV Shows, Podcasts, and Audiobooks, as well as a new “Search” option. As before, only available content types will be listed here, so if you don’t have any movies in your iTunes library, you won’t see the “Movies” heading. 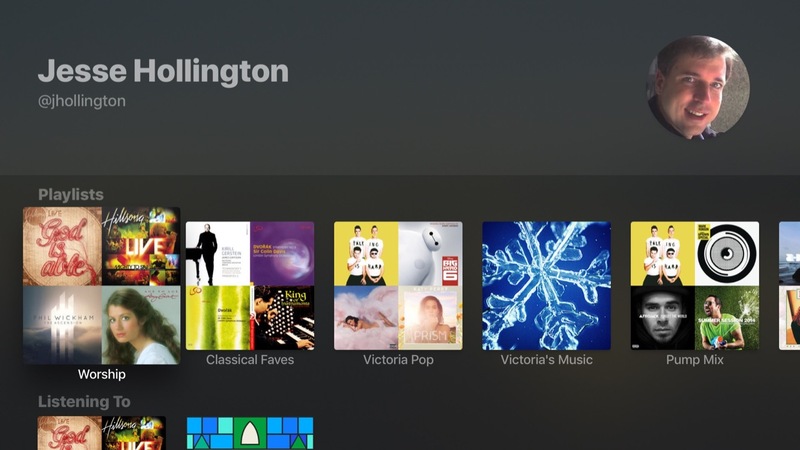 The Music section basically inherits the style of the Music app redesign from tvOS 10, while the other sections such as Movies and TV Shows now match the style of the TV app and corresponding iTunes apps. 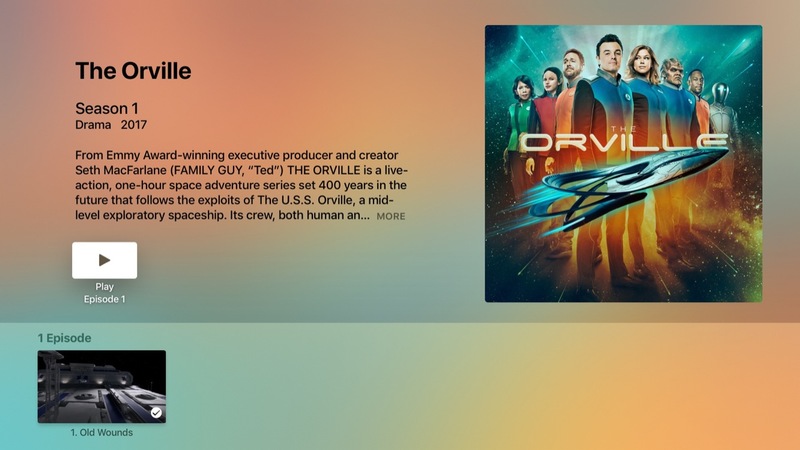 Individual movie and TV show items also gain the same type of info screens found in the tvOS iTunes apps. 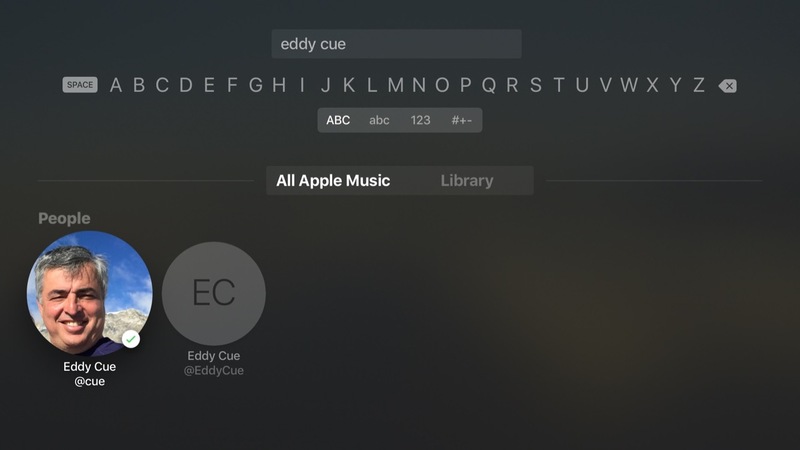 The tvOS Music app gains the new social features found in iOS 11 and iTunes 12.7, with the ability to search for and follow other Apple Music profiles and see what your friends are listening to. You can search for other users from the standard search window, and you can access your own profile by swiping up to your profile picture in the “For You” section. 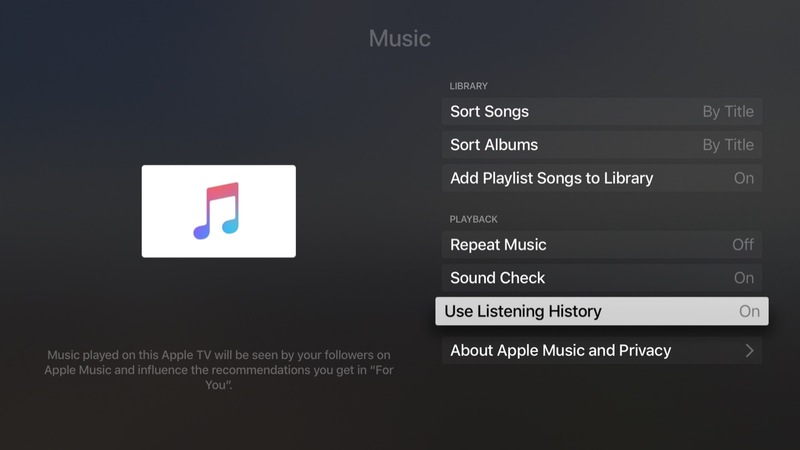 The Music settings (Settings, Apps, Music) gain the additional “Use Listening History” setting, similar to the option found in iTunes 12.7, to allow you to choose whether the music you listen to on your Apple TV will be visible to your followers on Apple Music and influence your “For You” recommendations. If multiple family members listen to your Apple TV music library, you’ll probably want to turn this option off unless each family member normally switches to their own Apple ID before listening. 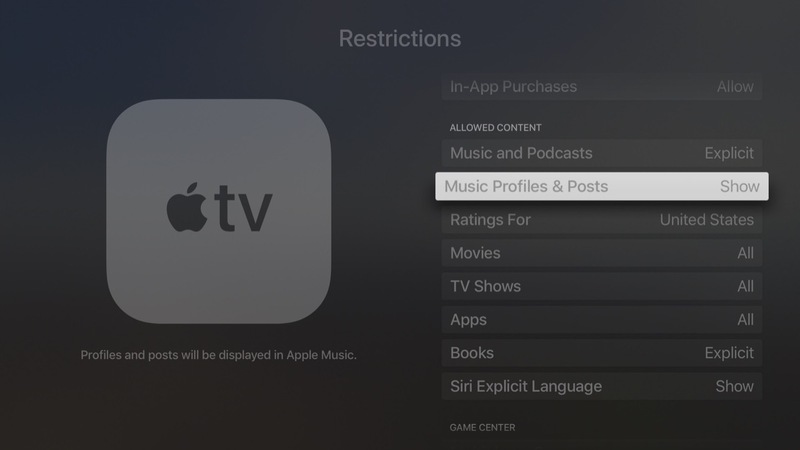 If you don’t want to use any of the Apple Music sharing services on your Apple TV, the Restrictions settings include a new option to hide music profiles and posts entirely. Apple has expanded its TV App internationally with the release of tvOS 11, with Canada and Australia gaining access to the new app this week (albeit with a limited number of content providers thus far), and France, Germany, Norway, Sweden and the UK expected to get the TV app later this year. Beyond the wider availability, the app itself doesn’t appear to have gained any significant enhancements, however.